Highly Recommended for wargamers wanting simple but accurate models. For many years wargamers were stuck with one of two options: purchasing relatively inexpensive models in various scales (HO being the most common) and giving up a lot of details, or purchasing 1/72 scale kits that were very involved to assemble and somewhat fragile when placed in the world of rolling dice and lots of handling. The solution usually was to go to an odd scale like 1/108 or 1/120 and get resin or white metal models, which gave up details for durability. Over the past few years companies like Italeri and Zvezda have started to introduce lines of easily assembled 1/72 scale models designed as a compromise for the best of both worlds. 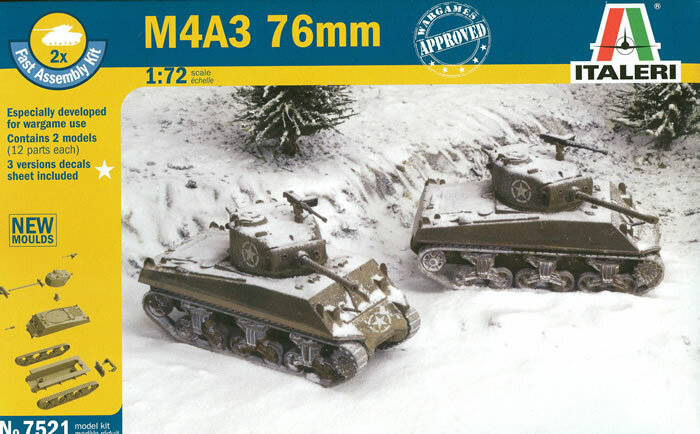 This kit provides two very simple models of the late war M4A3 76mm tanks with late model hulls and VVSS suspension. The tanks come with a number of nice touches such as the rear exhaust defelectors and a sturdy M2HB machine gun for the turret. The gun and mantlet are separate parts as is the bow machine gun. The compromises are many but work to the wargamer’s advantage. There are no end connectors on the tracks (to make them simple to mold) and the headlights and taillights are molded in place along with their guards. The turret bustle is hollow, and no luggage rack is provided for the hull. The good news is the basics are all here, and a determined modeler (or upscale wargamer) could modify or detail most of these parts with little trouble – drilling out lifting eyes, adding MV Lenses to the headlights, a wire antenna, filling in the bustle with putty – and make a good scale model out of the kit. It would take more work to add the end connectors from slices of Plastruct triangular styrene, but it could be done. Three different sets of markings are included: 42nd Tank Battalion, 11th Armored Division, Belgium 1945; 752nd Tank Battalion, 5th Army, Italy 1945; or 13th Tank Battalion, 1st Armored Division, Italy 1945. A small sheet of targeted decals is provided, so unfortunately entire units cannot be modeled. Overall this is a nicely done little set and one I wish I had found as a kid when we did wargaming with ROCO miniatures – we could have used our other models with them.